16034 Portofino – (GE), Northwest Italy. 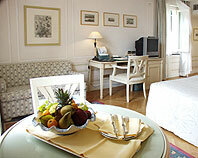 A small but Immaculate and Charming luxury hotel right on the water front of Portofino. The annex for the famous "Hotel Belmond Splendido*****", an Orient-Express Hotel and part of the Leading Hotels of the World chain, "Hotel Splendidio Mare "is one of the more charming, small hotels of the world. The hotel is cobbled together from several village houses that lead to and overlook the charming old fishing port (now pleasure port) of Portofino in Northwest Italy not far from the French border. It even has its own small trattoria with simple, delicious food served both inside and out overlooking the busy port. The rooms are finished beautifully, the furnishings immaculate, attention paid to the last detail. The bathrooms are modern and spacious considering the size constraints of these old village houses. Its location, while romantic and ideal for enjoying the village has a downside. It will bother some and not others. It is exposed to the noise of evening revelry and is remote from the parking facilities which are far from ideal. This is not unique to this hotel; all the village businesses share the same problem. The hotel management has attempted to alleviate the parking problem for their patrons; the hotel has provided a valet service in the village square (more of a rectangle) just outside the entrance to the public multi-story parking garage and carry your luggage down the cobblestone street to the hotel for you. Not an insignificant detail since the walk is not brief. If you are traveling light and have no need to access your car, this is not a problem. However if you have copious baggage and require access to your vehicle, then this can be quite an inconvenience. So if you want to stay in the heart of this uniquely beautiful old fishing village, this is a very charming and comfortable place to lodge. Just be aware that there are certain inconveniences to entertain and knowing them in advance can allow you to be prepared. If these bother you, you can always stay up the hill at the main hotel that has a shuttle service to the village.